Custom Menu Sizes - Just Ask! Great menus begin with good paper. The Menu is the lifeblood of the food industry. Whether it's on the wall, on a chalkboard or on the table, your menu is your brand. Our team can help you look your best with crisp color, durable paper options and custom shapes and sizes that tell customers you care about creating a quality experience. We are the experts in professional menu printing on SmartFlex® plastic paper stock. Menus made from SmartFlex™ are durable and easy to clean with soap and water. We make the printing look great, and the folds even. We do it better than anyone in the industry. SmartFlex® is water, tear, stain and heat resistant so you won't have to print your restaurant menus over and over. It looks and feels much better than lamination and lasts a lot longer. 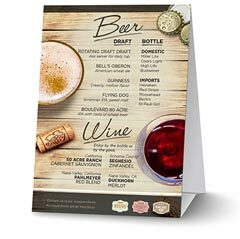 If you just need a little help creating your bar or restaurant menu, check out our menu fold and layout templates. Templates are available for all of our standard menu sizes and folds. Insert your text, image and logo for a personalized design. 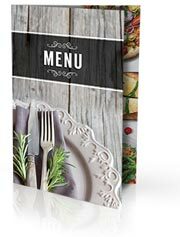 Don't have a menu designed and ready to print? You've got options! Would you like expert help with your menu design? PFL has a team of designers who can create any custom product just for you. You will work one-on-one with your designer to guarantee your vision is realized on paper. Our graphic designers are highly qualified and experienced (over 50 years combined!). They understand good design principles, and have extensive pre-press knowledge. But more importantly, they create designs that function the way you need them to - helping you grow your business! Get started with a single sheet menu or multi-page, one of a kind die cut synthetic menu. Simply call 800-­930-2423 and let us do the rest! 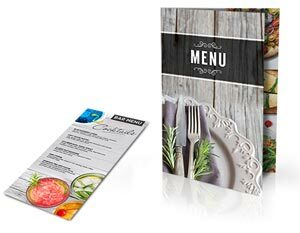 Creative restaurant menu printing is all about selling your food and beverages! A well designed menu can increase sales and promote your business at the same time. A menu is a marketing tool and should be informative and easy to read. Your menu should also get customers excited about the food and the experience in your restaurant. Menus offered as a Direct Mail Piece are a great way to get the word out about your restaurant. Mini-Menus, also known as "Pocket-Menus" or menu cards are perfect for your customers to take on-the-go. Compliment your Menu with matching Table Tents that highlight a dessert or drink offer. Print a standard tri-fold menu that doubles as a brochure or promotional piece. Incorporate a scratch and sniff to increase interest in your menu and your restaurant. Custom Folds available: Accordion-Fold, Z-Fold and many others. Spiral bound booklet - Commonly used for wine lists that are offered by the bottle or other very large menus. To get started on your custom menu project, call our helpful printing experts now at 800-­930-2423 or request a printing quote. We'll get your quote to you within one business day, usually in just a few hours. There's no substitute for seeing actual physical examples of the menus we can print. Just let us know what type of products you would like to see along with your quote or request printed samples here.